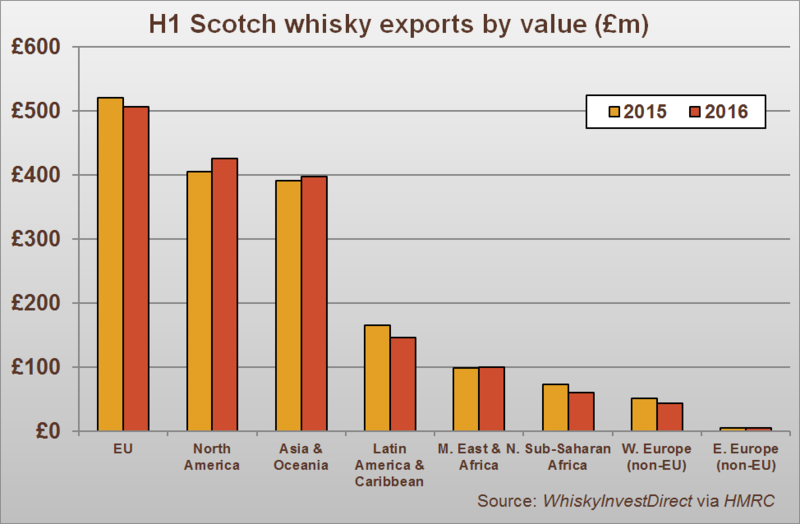 SCOTCH WHISKY exports experienced a mixed first half of 2016, as growth in North America and Asia & Oceania was offset by downturns in Latin America and Sub-Saharan Africa, write Rupert Patrick and Leon Kuebler. On the one hand, figures from HMRC show that Scotch delivered its best H1 performance since 2013. The first six months of 2016 saw the total volume of Scotch sent overseas increase by 2.6% year-on-year; this was the first time since 2013 that export volumes had increased over this period. A total of 148m LPA worth of Scotch was exported in the first 6 months – enough for 530m bottles, the equivalent of 34 bottles per second. The total value of Scotch whisky sent worldwide in the first half of 2016 was £1,690bn. Although this was a -1.5% decline on the same period in 2015, it was a sizeable improvement on the -3.1% figure given in H1 2015, and the -11% drop in 2014. Traditionally, H1 is the weaker half of the year for Scotch whisky, as the majority of sales occur in the build-up to Christmas and New Year in H2. In the years 2010-2015, both the value and volume of all Scotch exported in H1 averaged 44% of the annual total. The exception to this rule was H1 2013, the peak in total H1 export value to date, when a full 47% of the year’s Scotch exports occurred in the first half of the annum. The recovery in the volume of Scotch whisky exports in H1 2016 suggests that the decline in Scotch exports, which first began in 2014, is slowing. This gives added substance to the conclusion drawn by WhiskyInvestDirect from the Q1 figures, first reported here in May, that Scotch exports were firming in 2016. The improvement in the volume of Scotch exported has occurred uniformly over the course of the year to date. 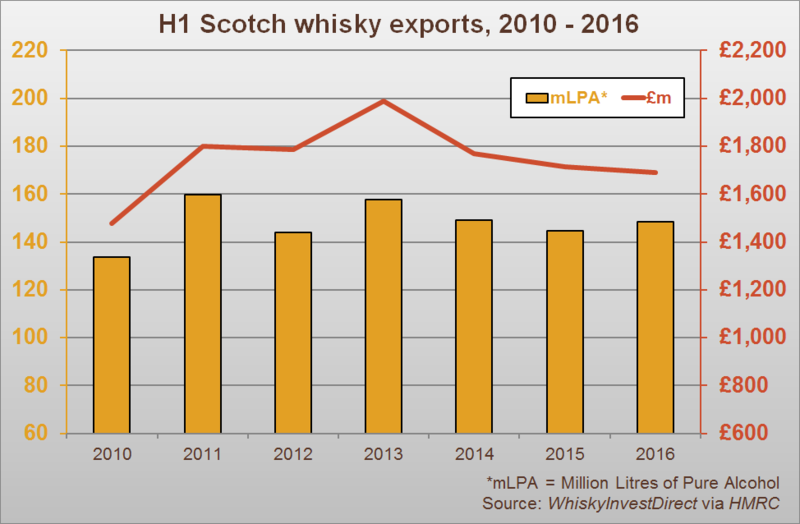 In Q1 2016, the LPA (Litres of Pure Alcohol) of Scotch shipped overseas was up by 2.5% compared to Q1 2015; for Q2, the year-on-year increase was also 2.6%. On closer inspection, the consolidation of Scotch exports in 2016 is also borne out in value terms. The overall value of Scotch exports dropped by -1.5% in H1 2016, due to a -2.7% year-on-year decline in Q2. In Q1 2016, export values had been stagnant, at -0.1%. As the above chart shows, the decline in value seen in Q2 2016 is almost wholly attributable to the 23% drop in exports of Scotch to Latin America and the Caribbean over this period. 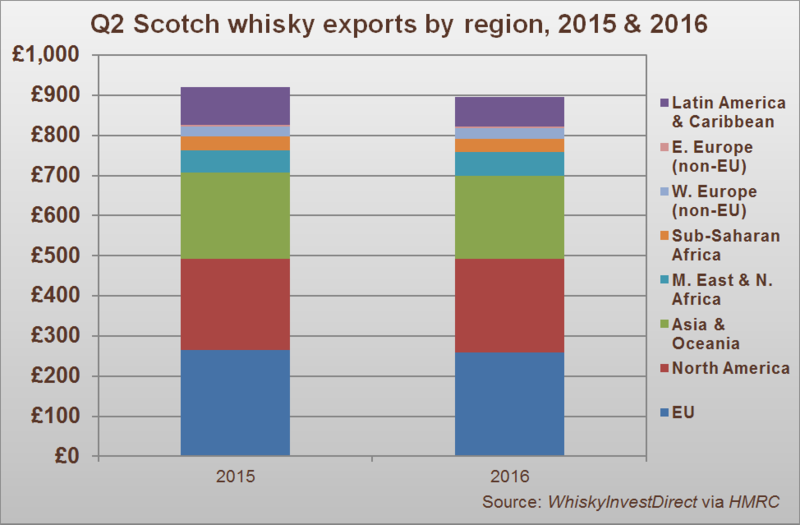 Beyond Latin America, the value of Scotch exports to all other regions again remained broadly constant. Over the first half of 2016 as a whole, exports of Scotch continue to be spread relatively evenly between the three major markets – the European Union, North America and Asia & Oceania. In H1 2016, the value of shipments to the European Union declined slightly, by 2.7%. France, the largest market for Scotch by volume, continued to exhibit a shift towards value products, as imports of Scotch whisky declined by -5.7% in value but risen by 4.6% in volume. More positively, exports to Germany, the Netherlands and Poland have all experienced growth in both volume and value in 2016 to date. The value of Scotch dispatched to North America and Asia & Oceania increased by 4.9% and 1.8% respectively. Exports of Scotch to the United States, the largest market for Scotch worldwide, have increased by £31m compared to H1 2015 – a near double-digit increase of 9.5%. Record H1 figures were also seen in Australia and India. India, the world’s largest market for whisky, experienced a 28% rise in the value, and a huge 41% boost in the volume, of Scotch whisky imported in H1 2016 compared to the previous year. Double-digit declines were seen in the export values of Scotch to Latin America & Caribbean (-11%), Sub-Saharan Africa (-17%) and non-EU Western Europe (-15%). In each region, however, this decline was largely attributable to conditions in one country. For example, over 70% of the decline in exports to Sub-Saharan Africa was due to decreased demand in South Africa. The same was true of Turkey’s share of the decline in Scotch exports to non-EU Western Europe. In Latin America & Caribbean, meanwhile, two island nations – Aruba and Curacao – accounted for 57% of the overall decline of Scotch shipped to the region. Both South Africa and Turkey have experienced recent economic slowdowns. World Bank forecasts suggest that the South African economy is currently stagnating, while Turkish exports were already weakening before July’s attempted coup. For further analysis, read 'Scotch whisky, H1 2016: Diverging trends in major markets'. Leon Kuebler is Head of Research at WhiskyInvestDirect, the online platform for buying, owning and trading whisky at low cost as it matures in barrel.